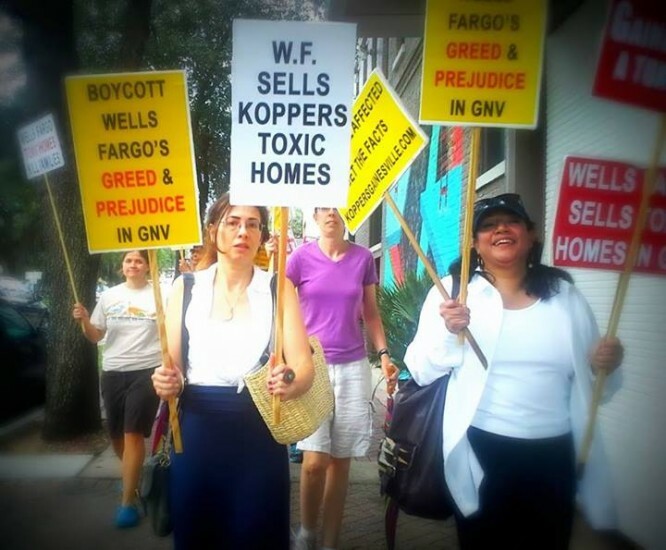 Koppers-afflicted residents thank everyone who came out and demonstrated against Wells Fargo’s toxic criminal activities on July 19th. Friday’s rally, the first of a series, was wet, wild, and really loud! Details of upcoming rallies will be posted here, so keep visiting for more opportunities to raise your voice for environmental justice! 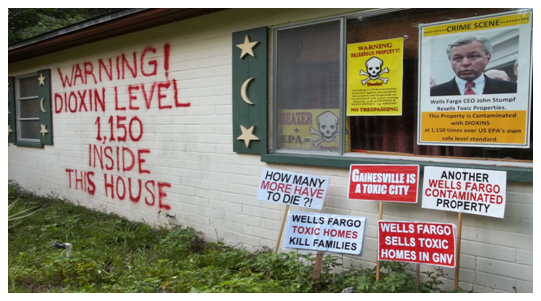 * Wells Fargo’s ongoing sales of uninhabitable dioxin-contaminated homes to unsuspecting low-income and minority families in neighborhoods surrounding Koppers Superfund Site in violation of Florida Statutes requiring full disclosure of the superfund hazard. * Dead Peasant Policies: Wells Fargo executives benefit financially from the deaths of their employees through insurance policies called “Dead Peasant Policies” that pay bonuses to key executives when employees and former employees die. WF’s Dead Peasant Policies have yielded $17.8 billion so far. * Wells Fargo systematic discrimination: The U.S. Dept. of Justice has come to a $175 million settlement with WF for pushing minority loan applicants into risky, high-cost subprime loans regardless of qualifications. *Wells Fargo for-profit prisons: WF-funded private prison companies cut rehab programs, limit staffing, deny adequate medical care, and distribute cheap food to increase revenue. WF also lobbies federal and state governments to enact harsher criminal and immigration laws to ensure a steady flow of prisoners and profits. * Wells Fargo debit card and payday lending scandals. *Wells Fargo predatory practices that kill homeowners like the typo victim, who died in court after WF wrongfully continued foreclosure proceedings after acknowledging that the homeowner had mistakenly received foreclosure papers due to a WF typo, had never missed a payment, and was not the intended party. *Wells Fargo bailout funds and programs that put taxpayers on the hook for up to $36.9 billion plus an unknown amount from the Federal Reserve’s $8 trillion in emergency programs. 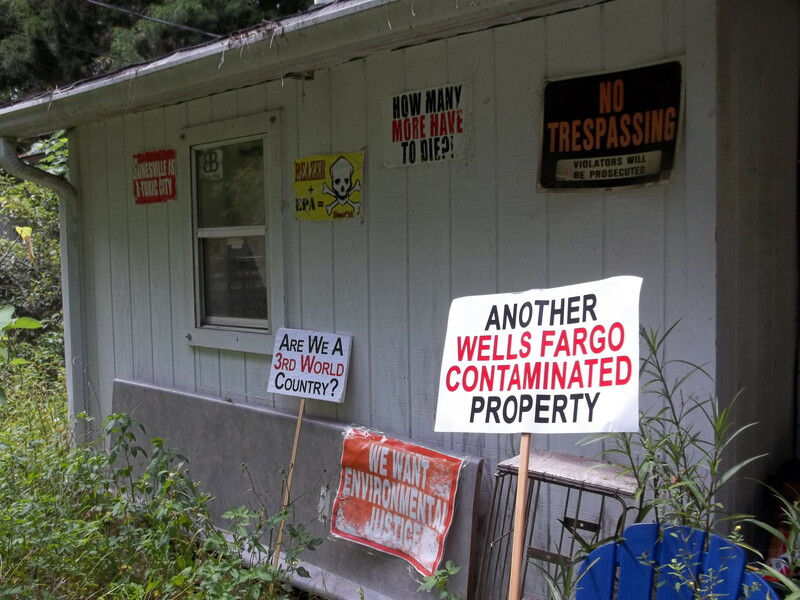 *Wells Fargo discriminatory neglect: WF has been ordered to pay $38.5 million to advocacy groups and regulators due to the bank’s neglect of foreclosure properties in minority areas. * Wells Fargo ongoing illegal foreclosures on US service members. * Wells Fargo violations: WF reneged on NY/NJ homeowners’ loan modifications after Hurricane Sandy, violating a $25 billion settlement for the same misbehavior prior to the super storm. * Wells Fargo thuggery: A breast cancer patient who never even had a WF mortgage was evicted at gunpoint by WF employees and the sheriff, despite the fact that a California court had placed a stay on the eviction which was posted on her front door. The best way to end this predatory practice is to walk away from WF and conduct our business through local credit unions. Greed and Prejudice are Unacceptable- Especially at the Cost of Our Families’ Health and Safety!!! 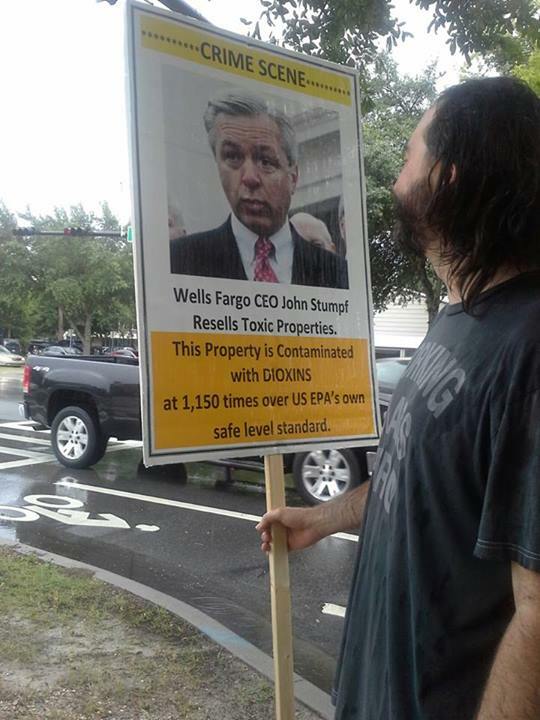 Rally Against Wells Fargo’s Greed and Prejudice on July 19th! 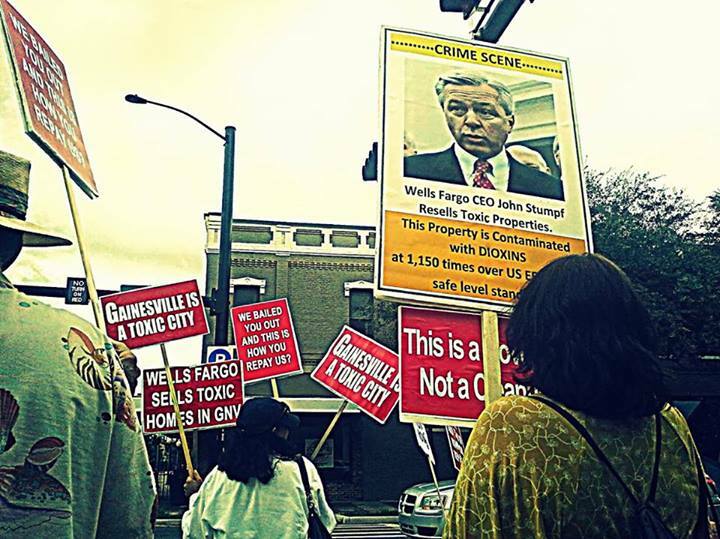 Wells Fargo spokeswoman Debora Blume told the Palm Beach Post that Wells Fargo requires their appraisers to identify contamination hazards, stating “Our agencies and investors prohibit the sale of loans when a proven property hazard affects safety and habitability.” Yet Wells Fargo continues to sell Gainesville houses that are documented to be severely contaminated with arsenic, PAH’s, and dioxins (aka agent orange) to unsuspecting low-income and minority families in neighborhoods surrounding the notorious Koppers Superfund Site, violating Florida Statutes that require full disclosure of this hazard with seeming impunity. Wells Fargo’s callous practice has brought misery to countless local families who have paid for WF’s lies with their health, even with their lives. Wells Fargo CEO John Stumpf, the highest paid CEO in US history, is still dissatisfied with his taxpayers’ bailout. Stumpf and his cronies give themselves outrageous bonuses while sentencing local families to a toxic nightmare, knowingly selling highly contaminated homes with no disclosure of the danger to homebuyers’ health and lives. This is just one of the many ways that Wells Fargo singles out innocent, vulnerable members of our community, a practice WF has been heavily fined for in other states. Tell Wells Fargo Our Families Are Worth More Than Your Profits!